John Carpenter is the unofficial official director of the October Horrorshow, so the month always feels a bit empty if it does not feature one of his films. No such worries this year. 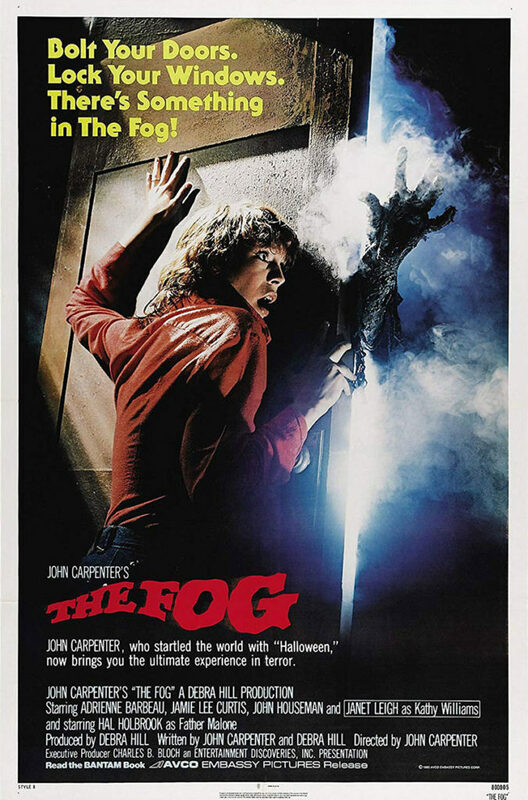 The Fog was Carpenter’s follow-up to Halloween, his hugely successful slasher flick. In that movie, a relentless killer terrorizes a town by night, stalking and killing people with very sharp objects. In The Fog, relentless killers (plural) terrorize a town by night, stalking and killing people with very sharp objects. The Fog is so similar to Halloween that a viewer could be forgiven for thinking Carpenter was a one trick pony. That’s not a fair assessment, but let’s put it this way — it would have been if Carpenter had suddenly died in a car accident before he got the chance to film Escape from New York. The fictional town of Antonio Bay is the setting for The Fog. The town is set to celebrate its centennial, but before that can happen, a fog bank descends on the town late at night, during the witching hour between midnight and one. This is no ordinary fog, however. As it approaches from the sea, it carries with it death, in the form of a ghost ship and its occupants. Are they undead pirates? Fishermen? Is it a Royal Navy sloop? The next day, after the film gets its first body count, the viewer is given an answer. Father Malone (Hal Holbrook), the local preacher, discovers a hidden diary in his church, written by his grandfather. In it, in detail, is the true story of the founding of the town. Without giving away too much, let’s just say the ghosts aboard the ship have a bone to pick with the town fathers, and have chosen the centennial in which to return and get their revenge. The ghosts are very much about killing everyone they come across, but that’s much less of a problem than one might think. Carpenter didn’t have a lot of resources to work with when making this film, so there aren’t that many people in it. Besides Holbrook, main cast members include Adrienne Barbeau as a local DJ, Jamie Lee Curtis as a hitchhiker, Tom Atkins as the creepy guy who picks her up, and Janet Leigh as a town official. The supporting cast is also small in number, and exist mostly as fodder for the bad guys. In Halloween, Carpenter showed that he was a master at stretching a production. The first key is having a story that can be filmed small, but is still compelling. The Fog is just as small as Halloween. All of the action takes place in only a handful of locations, and there aren’t that many scenes. It’s kind of weird, watching this film from over thirty years ago, in an era when expansive movies dominate at the box office. Lately, it seems like no movie is worth a second glance if it doesn’t lay a major American city to waste. There’s no such danger of that happening in Antonio Bay, because we viewers never see all that much of it. Just when a viewer is really geared up for the third act, they realize they are watching the final scene. Sure, Carpenter had to take some shortcuts dues to his budget, but let one’s mind wander a bit while watching this movie, and one may just miss it. Yet, this is only a slight fault with the movie. It’s pace is heightened by its swift end, and by the fact some of the action in the middle is just filler. But Carpenter is no slouch. He knew how to tell a story, and he always did his best work with limited resources. Where this film excels is in its atmosphere. Too many movies that have substantial action which takes place at night fail to grasp what nighttime means. Night is dark. I hardly believe I have to write that. But in many films, a viewer has to pretend that a character can’t see anything for the night. Not so, here. The dark is every bit as much a character as it was in Halloween. Funny, considering the menace in this film is supposed to be contained in fog. But the fog doesn’t show up at noon, does it? The dark, in fact, is the impenetrable menace in this movie, the aspect Carpenter relies on to convey most of the film’s uneasiness. It’s a simple concept, but one often ignored by other filmmakers. People are generally uneasy in the dark. Putting viewers there is a stroke of genius. But that is it for the genius. The rest of the film is middling for a Carpenter production. The plot is a little thin, and the acting is weak. For this, I have to blame the budget. A more expansive story would have broke the bank. Many scenes feel like there weren’t enough takes to get the scene right, and I suspect this had more to do with the cost of film than with Carpenter’s ability to judge the quality of a take. The Fog is not a bad movie, but it is frustrating. It feels as if a much better movie was just waiting to burst forth, but was never given the opportunity. For Carpenter fans, this is among his most Carpenter-esque. Those of you who are as into his movies as I am will know exactly what I mean.